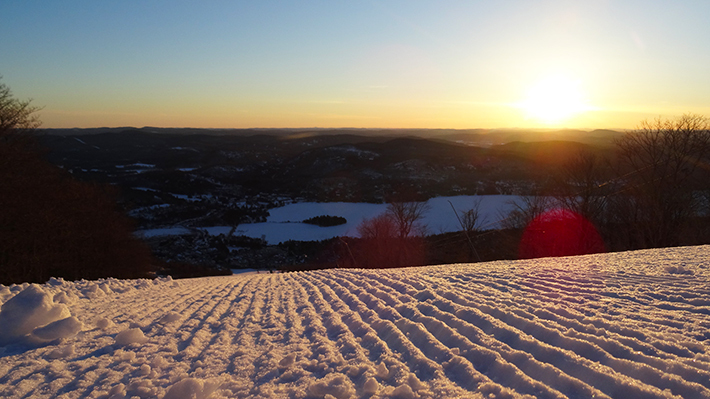 Springtime is the celebration of the end of winter and at Tremblant, we celebrate the snow until the very end! 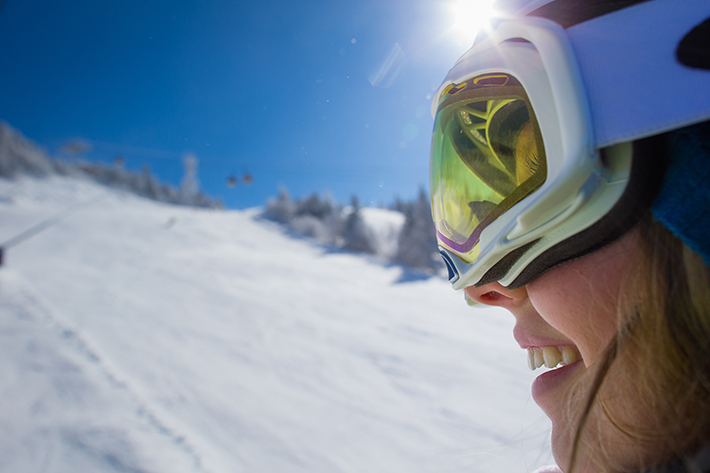 During this period you’ll notice people take more time going down the trails, not only because the snow is heavier and harder to ski, but because they’re soaking up the sun! It’s been months since we could feel that warmth on our frozen cheeks and +2°C feels like +20°C. Spring skiing is a completely different world and as such the grooming techniques are also different. The heavier wetter snow doesn’t cooperate as well, leading Richard Lyng of the mountain maintenance team to compare it to paste. Seeing as the water is absorbed at the base, it’s hard to get traction in most areas making grooming machines sink up to 10 inches deep in the slush. In the slippery spring conditions, we sometimes have to take the Winch Cat onto the Nansen pitch! 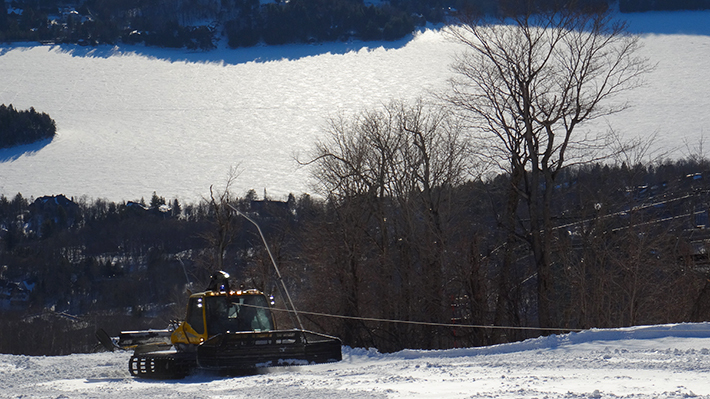 During the winter, the maintenance team will use a Winch Cat to groom steeper runs. The Winch is attached with a 7/16″ diameter steel cable to an anchor at the top of the run, then drops down the slope. This machine is powerful, pulling 6 tons of equipment and snow up steep pitches on a cable up to 1km long. Being in the cockpit is quite the experience, dangling mid-slope you feel like the trees are growing outwards instead of upwards! Just a quick warning for those who like to walk, snowshoe or trek across the mountain : avoid getting near a Winch Cat. Bright orange banners will always be placed obviously at the top and at the bottom of the groomed run, but if you come across a long steel cable, please be careful and turn around. The slower operating speeds do affect the number of trails that can be groomed in one night, but this is where a good strategy comes in. The maintenance crew have their eyes on the weather updates down to the minute, since they have to know if and when it’s going to freeze (or melt) in order to plan the nights work. The whole mountain must be done in 16 hours and for the grooming team it can be hard on the ego not to be able to produce the same quality surface they’ve delivered all season long. Because they can’t just compact wet springtime snow, a simple finishing is done to place it down. But when the sun sets it freezes, and so we notice that trails groomed later in the night have a higher chance of opening in the morning. With the priority of the trails such as they are – beginner, intermediate, experts – they will most likely groom the green runs last. The trail that was groomed in the evening might be closed in the morning because it’s too hard a surface. Same goes for mogul trails. If they become rock hard, they will not open. The maintenance team works closely with the patrol to determine which runs are open or not. The main reason a run will be closed is if the patrol isn’t able to ski down it with a toboggan. If they can’t rescue someone in case of an accident, the trail is deemed not safe enough. The patrol will often check a run hourly and decide to open it later in the day, when it gets softer. 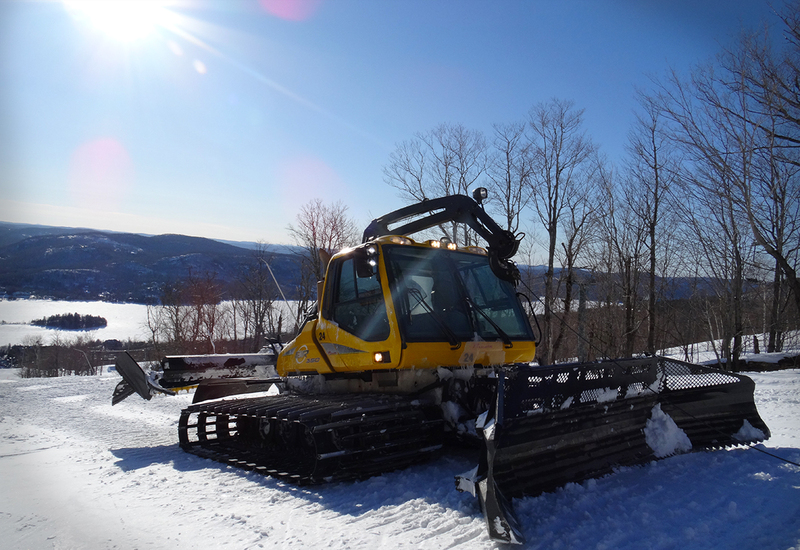 As of this week, with the warm front we had, the mountain maintenance team have already started reshaping the trails for spring: moving the snow up from the base and in from the sides. Shifting snow towards weaker areas will make the center of the runs last longer. Interesting fact: natural snow melts about ten times faster than man-made snow. The product of snow canons takes the shape of a bead rather than a flake and is thus more compact and less likely to get blown away by the wind. It’s what makes a nice solid base versus natural snow, where, as in the glades, you might sink more. Since we made lots of snow after a warm December, a lot of that is left on the trails. The next step to prolonging our spring skiing season will be to farm snow from the parks or other areas. In the meantime, let’s enjoy this March snowfall!